I hope everyone had a fantastic weekend. Mine was super relaxing and I did a good amount of cooking which is always fun. And eating. Whoops. No surprise there as that typically goes hand in hand. Some of the cooking was for Tablespoon articles and some was for weekday meal prep (score!!). Also included in this cooking bonanza was this wonderful salad I made for a cookout that I'm about to blow your mind with. I love cookouts..I love hosting them, attending them, whatever! i\It's one of the best parts of summer. And I copied it straight up, no changes needed. It was summer perfection in a salad bowl. 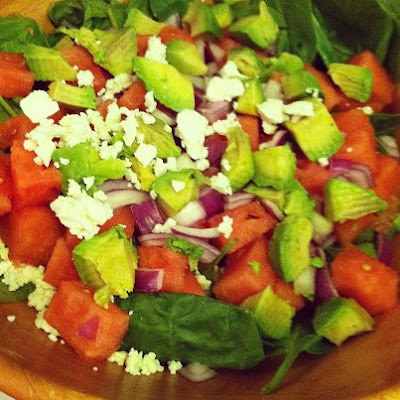 Sweet watermelon, combined with creamy avocado and savory feta...it's simply delightful. And let's not even talk about the homemade lime vinaigrette. Unfortunately I just took one photo of the salad (with my trusty iPhone), but I think it does it justice. Honestly, I didn't think it would be this good so I wasn't even thinking it would be blog worthy. But it was oh so blog worthy. If something can literally taste like summer, this salad does. The lime vinaigrette is incredibly easy to make and uses lime juice, olive oil, salt, pepper and agave. Whisk Whisk Whisk until your heart is content and your salad is perfectly dressed. Here's the full recipe. So,this blog post is pretty much over. Make the salad asap and it's basically the best thing ever for summer cookouts. In other news, I'm about to go on a tangent below if you're interested. TANGENT: I am not one of those ridiculous people that needs to make everything from scratch, although ideally, it would be fun. In fact, I used to shy away from making my own salad dressing because I figured they had an entire grocery store aisle filled with perfectly good dressing. But then I realized that salad dressing from a bottle is literally like the worst thing ever for you. Seriously. If you don't believe me, read this article called: Salad Dressing, the Silent Killer. It's admittedly a little dramatic, but damn it makes me want to make my own salad dressing. Also, I recently saw a book at the bookstore that was all about salad dressing. Which I thought was absolutely ridiculous and frankly kind of pissed me off because I've always wanted to write a book and I thought, this person got a book deal to write ALL about salad dressings? Are you joking me? But now I'm thinking that maybe this person knows about how bottled salad dressing is a a "silent killer" and maybe I shouldn't be so judgemental. Because really, she's got a book and I don't. Dammit. Did you guys make it through my tangent? I just really wanted to get that off my chest for some reason. Whew, I feel better! I'm odd, I know. Have a great week!